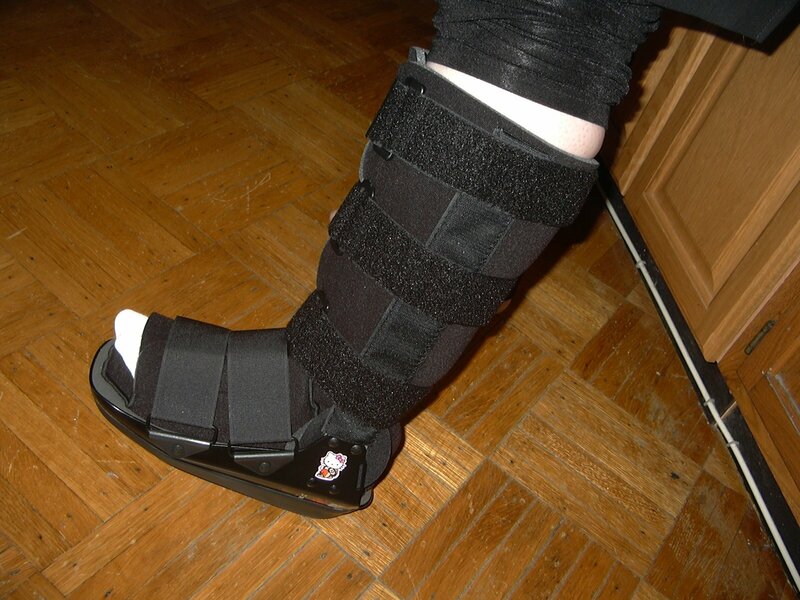 Yes, I have been booted now, which is a definite improvement over the crutches and Ace bandage. I taught today — up and down to the third floor a couple of times — so my foot was quite swollen by the time I got to the orthopedist. Crutches are painful! It was easier to limp up the stairs. But he looked at the x-rays and said very bad sprain, torn ligaments (insert Marge Simpson noise, which is what the doctor did as he pointed at all my bruises), calcium deposits from previous injuries to the ankle and, yes, it’s true! A heel spur and plantar fasciitis, but only coincidentally. So, I have the boot for walking around, I’m back to elevating and icing (or will be in a minute or so), and will be starting physical therapy to begin the healing process so I won’t be lame for ever. It’s a relief to know what is wrong instead of guessing, but it’s still painful (and inconvenient). On the plus side, my students and colleagues were very helpful to me today and I have already Sanrio-fied the boot (well, duh! ), Hello Kitty on the left and Badtz-Maru on the right. Hear, hear! Drinking lots of beer will cushion any and all falls.Doesn’t your building have an elevator? Mmmm, beer!Well, Wendy, there’s no elevator at home — or did you mean on campus. Yes, there is one small elevator in the building where I teach, at the opposite end. So I had to hobble down to the far end, up the longest ramp, in through a tiny door with no handicap button, and then hop all the way back to the other end of the building (this is two buildings that have been joined together). It was easier to take the stairs.I have *no* upper arm strength! My shoulders were so stiff yesterday from using the crutches.